Sorry I didn’t post last week, had a chest infection and it knocked me sideways, anyways I am a lot better now and have started to crochet again. I was a week late in starting my dash for the finish line in the Ravellenics 2016 games on Ravelry. I am in Team Colourful Cals. I have entered three events, Cowl Jump, WIP Wrestling and Household Heptathlon . And whoo hoo I have finished two! The Cowl was first to cross the finish line. It is Beach Sunset Cowl pattern here. Although mine is more like Beach Waves! The second item to cross the line is a doily which is also the August Doily Cal in Weekly and Dishcloths2016 group on Ravelry. This entered in the Household Heptathlon and submitted for the Lace Laurel. Baroque Inspiration by Denise Augostine, pattern here. The WIP Wresting project is progressing, I have a couple of more squares to join and then I can start on the border, I am doing border 72 from the book Around the Corner by Edie Eckman. This photo was taken Saturday, The light is real bad for an up to date photo this morning and I need to recharge my batteries (both sets) for my camera! Well that’s all the crochet I have been doing for the last fortnight, this week I hope to finish the Bamm 2015 Afghan, and then as I promised myself I can do a new Cal! I am tossing up between the Sweet Pea by Julie Yeager that starts middle of September, or the Lotus Moon Tiles by Polly Plum that starts today!!!. Have a great week everyone and thanks for visiting. Hope to get around to you all later today. 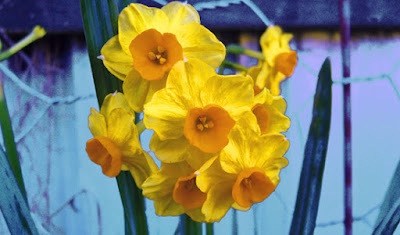 I will leave you with a photo of some jonquils from my garden, Spring is on its way! So glad you are doing better. Beautiful cowl and doily!!!!! That's great the blanket is almost done. I LOVE your cowl! You must post its project page as I like yours better than the pattern page's. Nice doily. I'm sorry you had a chest infection. How horrible. I'm glad you're better; pls take it easy. Glad you're feeling better! I am in love with that doily, it's gone immediately into my queue! I'm glad your are better ! Love your cowl ( great colors ), your doily is adorable and your squares, perfect !!!! Glad you are feeling better. I love the squares you have made - so intricate. I love your beach waves! I think your colors are beautiful. And your doily is lovely. I look forward to seeing your finished blanket. The colors you've chosen are just wonderful. I am so glad you are feeling better. That sounds like it was awful. Everything you made is amazing!! I especially love your cowl in those beautiful shades of blue. Your doily is so pretty too. What a beautiful peace to showcase in your house and your color combo is so pretty. Your squares look beautiful too. I love making blankets like that. I am so curious which cal you will do now.... the Lotus moon tiles look stunning!!!! Good luck choosing. It's good to hear you are well again. I love the cowl and the doily but that blanket just looks so gorgeous! I checked out both those CAL's and I don't know how you are going to decide, I do love the Lotus Moon tiles, it is gorgeous! Glad you are feeling better, the cowl is stunning, well done.